The American Museum of Natural History (AMNH), located in Manhattan, New York, U.S., is one of the largest and most well-known museums in the world. Situated on park-like grounds in the borough's Upper West Side, the museum comprises 25 interconnected buildings that house 46 permanent exhibition halls, various research laboratories, as well as the largest independent natural history library in the Western Hemisphere. 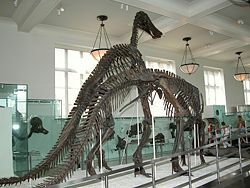 The AMNH has a collection consisting of over 32 million specimens and artifacts, of which only a small fraction are displayed at any given time. Behind the scenes, the museum has a scientific staff of more than 200, and sponsors over 100 special field expeditions each year. For well over a century, the museum has served the world's public as an institution of advanced research as well as a showcase for the various phenomena of nature and humankind. Plans for the AMNH were developed in the mid-nineteenth century by a group of New York's most elite and proactive philanthropists, public officials, and city planners. Among them were Theodore Roosevelt, Sr. (father to former president Theodore Roosevelt Jr.), John David Wolfe, William T. Blodgett, Robert L. Stuart, Andrew H. Green, Robert Colgate, Morris K. Jesup, Benjamin H. Field, D. Jackson Steward, Richard M. Blatchford, J. Pierpont Morgan, Adrian Iselin, Moses H. Grinnell, Benjamin B. Sherman, A. G. Phelps Dodge, William A. Haines, and Charles A. Dana. At the head of the group, was the naturalist Dr. Albert S. Bickmore, who lobbied tirelessly for years for the establishment of a natural history museum in New York. His proposal, backed by his powerful sponsors, won the support of then Governor of New York, John Thompson Hoffman, who signed a bill officially creating the American Museum of Natural History on April 6, 1869. The American Museum of Natural History, c. 1900-1910. 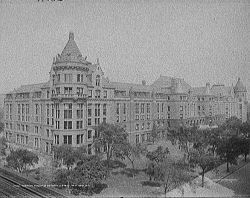 Prior to construction of the present complex, the museum was housed in the old Arsenal building in Central Park. In 1874, ground was broken for the first of many buildings which comprise the current complex that now occupies most of Manhattan Square. In 1936, an entrance on Central Park West was installed as the New York State Memorial to Theodore Roosevelt. The overscaled Beaux-Arts monument leads into a vast Roman basilica which serves as a lobby to the museum. Recently the museum's 77th street foyer, renamed the Grand Gallery has been redone in gleaming white and is illuminated by classic Romanesque fixtures. The famous Haida canoe is now fully suspended, giving the appearance that it is floating above the viewer. From its founding in 1880, the Library of the American Museum of Natural History has grown into one of the world's great natural history collections. In its early years, the Library expanded its collection mostly through such gifts as the John C. Jay conchological library, the Carson Brevoort library on fishes and general zoology, the ornithological library of Daniel Giraud Elliot, the Harry Edwards entomological library, the Hugh Jewett collection of voyages and travel, and the Jules Marcou geology collection. In 1903, the American Ethnological Society deposited its library in the Museum and in 1905 the New York Academy of Sciences followed suit by transferring its collection of 10,000 volumes. Today, the Library's collections contain over 450,000 volumes of monographs, serials, pamphlets and reprints, microforms, and original illustrations, as well as film, photographic, archives and manuscripts, fine art, memorabilia, and rare book collections. The library collects materials covering such subjects as mammalogy, geology, anthropology, entomology, herpetology, ichthyology, paleontology, ethology, ornithology, mineralogy, invertebrates, systematics, ecology, oceanography, conchology, exploration and travel, history of science, museology, bibliography, and peripheral biological sciences. The collection is rich in retrospective materials—some going back to the fifteenth century—that are difficult to find elsewhere. The museum boasts habitat groups of African, Asian, and North American mammals, the full-size model of a Blue Whale suspended in the Milstein Family Hall of Ocean Life (reopened in 2003), the 62 foot (19 m) Haida carved and painted war canoe from the Pacific Northwest, the massive Cape York meteorite, and the "Star of India," the largest blue sapphire in the world. The circuit of an entire floor is devoted to vertebrate evolution. The museum has extensive anthropological collections: Asian Peoples, Pacific Peoples, Man in Africa, Native-American (United States) collections, general Native American collections, and collections from Mexico and Central America. The Hayden Planetarium, connected to the museum, is now part of the Rose Center for Earth and Space, housed in a glass cube containing the spherical Space Theater, designed by James Stewart Polshek. The Heilbrun Cosmic Pathway, which serves as the exit ramp for the Space Theater, though really a minor exhibit, is one of the more popular exhibits in the Rose Center. The Center was opened February 19, 2000. The Anne and Bernard and Anne Spitzer Hall of Human Origins, formerly The Hall of Human Biology and Evolution, opened on February 10, 2007. Originally known under the name "Hall of the Age of Man," it is located on the first floor of the museum. The display traces the story of Homo sapiens, the path of human evolution, and examines the origins of human creativity. The hall features four life-size dioramas of the human predecessors Australopithecus afarensis, Homo ergaster, Neanderthal, and Cro-Magnon, showing each in its habitat and demonstrating the behaviors and capabilities that scientists believe it had. Also displayed are full-sized casts of important fossils, including the 3.2-million-year-old "Lucy" skeleton, the 1.7-million-year-old "Turkana Boy," and Homo erectus specimens including a cast of "Peking Man." The Harry Frank Guggenheim Hall of Minerals is a vast, darkened room in which hundreds of unusual and rare specimens glow under brilliant spotlights. It adjoins the Morgan Memorial Hall of gems. On display are many renowned pieces that are chosen from among the museum's more than 100,000 specimens. Included among these are the Patricia Emerald, a 632 carat (126 g), 12 sided stone that is considered to be one of the world's most fabulous emeralds. It was discovered during the 1920s, in a mine high in the Colombian Andes and was named for the mine-owner's daughter. Also on display is the 563 carat (113 g) Star of India, the largest, and most famous, star sapphire in the world. It was discovered over 300 years ago in Sri Lanka, most likely in the sands of ancient river beds from where star sapphires continue to be found today. It was donated to the museum by the financier J.P. Morgan. The thin, radiant, six pointed "star," or "asterism," is created by incoming light that reflects from needle-like crystals of the mineral rutile which are found within the sapphire. The Star of India is polished into the shape of a cabochon, or dome, to enhance the star's beauty. Among other notable specimens on display are the 596 pound Brazilian Princess topaz, the largest topaz in the world, and a four and one half ton specimen of blue azurite/malachite ore that was found in the Copper Queen Mine in Bisbee, Arizona at the turn of the century. Most of the museum's rich collections of mammalian and dinosaur fossils remain hidden from public view. They are kept in numerous storage areas located deep within the museum complex. Among these many treasure troves, the most significant storage facility is the ten story Frick Building, which stands within an inner courtyard of the museum. During construction of the Frick, giant cranes were employed to lift steel beams directly from the street, over the roof, and into the courtyard in order to ensure that the classic museum facade remained undisturbed. The predicted great weight of the fossil bones lead designers to add special steel reinforcement to the building's framework. The fossil collections occupy the basement and lower seven floors of the Frick Building while the top three floors contain laboratories and offices. It is inside this particular building that many of the museum's intensive research programs into vertebrate paleontology are carried out. Other areas of the museum contain equally fascinating repositories of life from thousands and millions of years in the past. The Whale Bone Storage Room is a cavernous space in which powerful winches come down from the ceiling to move the giant fossil bones about. Upstairs in the museum attic there are yet more storage facilities including the Elephant Room, and downstairs from that space one can find the tusk vault and boar vault. The great fossil collections that are open to public view occupy the entire fourth floor of the museum, as well as a separate spectacular exhibit that is on permanent display in the Theodore Roosevelt Memorial Hall, the museum's main entrance. On the 77th street side of the museum the visitor begins in the Orientation Center which leads directly into the wonderful Moorish architecture of the museum's oldest building where the 'fossil tour' begins. A carefully marked path takes the visitor along an evolutionary tree of life. As the tree "branches," the visitor is presented with the family relationships among vertebrates. This evolutionary pathway is known as a cladogram; of which the museum's fourth floor is the world's largest and most dramatic. To create a cladogram, scientists look for shared physical characteristics to determine the relatedness of different species. For instance, a cladogram will show a relationship between amphibians, mammals, turtles, lizards, and birds since these apparently disparate groups share the trait of having "four limbs with movable joints surrounded by muscle." This makes them tetrapods. A group of related species such as the tetrapods is called a clade. Within the tetrapod group only lizards and birds display yet another trait: Two openings in the skull behind the eye. Lizards and birds therefore represent a smaller, more closely related clade known as diapsids. In a cladogram, the evolutionary appearance of a new trait for the first time is known as a node. Throughout the fossil halls, the nodes are carefully marked along the evolutionary path and these nodes alert visitors to the appearance of new traits representing whole new branches of the evolutionary tree. Species showing these traits are on display in alcoves on either side of the path. The updated fossil halls celebrate the museum's architecture. Grand windows overlook Central Park and classic fixtures provide light. Many of the fossils on display represent unique and historic pieces that were collected during the museum's golden era of world-wide expeditions (1930s through the 1950s). On a smaller scale, expeditions continue into the present and have resulted in additions to the collections from Vietnam, Madagascar, South America, and central and eastern Africa. The fourth-floor halls include the Hall of Vertebrate Origins, Hall of Saurischian Dinosaurs (recognized by their grasping hand, long mobile neck, and the downward/forward position of the pubis bone, they are forerunners of the modern bird), Hall of Ornithischian Dinosaurs (defined by a pubic bone that points toward the back), Hall of Primitive Mammals, and Hall of Advanced Mammals. Tyrannosaurus rex: Composed almost entirely of real fossil bones, it is mounted in a horizontal stalking pose beautifully balanced on powerful legs. The specimen is actually composed of fossil bones from two T. rex skeletons discovered in Montana in 1902 and 1908, by the legendary dinosaur hunter Barnum Brown. Mammuthus: Larger than its relative the wooly mammoth, these fossils are from an animal that lived 11,000 years ago in India. Apatosaurus: This giant specimen was discovered at the end of the nineteenth century. Although most of its fossil bones are original, the skull is not, since none were found on site. It was only many years later that the first Apatosaurus skull was discovered and so a plaster cast of that skull was made and placed on the museum's mount. A Camarasaurus skull had been used mistakenly until a correct skull was found. On September 27, 2007, an 80-million-year-old, 2-feet-in-diameter fossil of ammonite made its debut at the Museum of Natural History. It became extinct 65 million years ago, at the time of the dinosaurs. Korite International donated it after its discovery in Alberta. Renowned naturalists, artists, photographers, taxidermists and other museum personnel have all blended their talents to create the great habitat dioramas which can be found in halls throughout the museum. Some of the diorama halls have themselves become major attractions for museum visitors from around the world. Notable among these is the Akeley Hall of African Mammals, which opened in 1936. The enormous hall with its muted lighting creates a reverential space that showcases the vanishing wildlife of Africa. A herd of eight enormous elephants appear to thunder down the middle of the room while along the perimeter 28 brilliantly lighted windows usher the viewer into a world that many will never personally see. The hall is decorated in rich serpentinite, a volcanic stone that deepens the contrast with the diorama windows. Some of the displays are up to 18 feet (5 m) in height and 23 feet (7 m) in depth. Carl Akeley was an outstanding taxidermist employed at the Field Museum in Chicago when the AMNH sent him to Africa to collect elephant hides. Akeley fell in love with the rainforests of Africa and decried the encroachment of farming and civilization into formerly pristine natural habitats. Fearing the permanent loss of these natural areas, Akeley was motivated to educate the American public by creating the hall that bears his name. Akeley died in 1926, from infection while exploring the Kivu Volcanoes in his beloved Belgian Congo, an area near to that depicted by the hall's magnificent gorilla diorama. With the 1942 opening of the Hall of North American Mammals, diorama art reached a pinnacle. It took more than a decade to create the scenes depicted in the hall which includes a 432 square foot (40 m²) diorama of the American bison. Today, although diorama art has ceased to be a major exhibition technique, dramatic examples of this art form are still employed. In 1997, museum artists and scientists traveled to the Central African Republic to collect samples and photographs for the construction of a 3,000 square foot (300 m²) recreation of a tropical African rainforest, the Dzanga-Sangha rainforest diorama in the Hall of Biodiversity. Other notable dioramas, some dating back to the 1930s have recently been restored in the Milstein Hall of Ocean Life. The hall is a 29,000 square foot (2,700 m²) bi-level room that includes a delicately mounted 94 foot (29 m) long model of a blue whale swimming beneath and around video projection screens and interactive computer stations. The entire room is bathed in a blue shimmering light that gives a distinct feel of the vast oceans of our world. Among the hall's notable dioramas are the sperm whale and giant squid, which represents a true melding of art and science, since an actual encounter between these two giant creatures at over one half mile depth has never been witnessed. Another celebrated diorama in the hall is of the Andros coral reef in the Bahamas, a two-story-high diorama that features the land form of the Bahamas and the many inhabitants of the coral reef found beneath the water's surface. The original Hayden Planetarium, opened in 1935, was demolished and replaced in 2000 by the $210 million Frederick Phineas and Sandra Priest Rose Center for Earth and Space. Designed by James Stewart Polshek, the building consists of a six-story high glass cube enclosing a 87-foot illuminated sphere that appears to float—although it is actually supported by truss work. James Polshek has referred to his work as a "cosmic cathedral." The facility encloses 333,500 square feet of research, education, and exhibition space as well as the Hayden planetarium. Also located in the facility is the Department of Astrophysics, the newest academic research department in the museum. Further, Polshek designed the 1,800 square foot Weston Pavilion, a 43 foot high transparent structure of "water white" glass along the museum's west facade. This structure, a small companion piece to the Rose Center, offers a new entry way to the museum as well as opening further exhibition space for astronomically related objects. The museum is located at 79th Street and Central Park West, accessible via the B and C lines of the New York City subway. In J. D. Salinger's book, The Catcher in the Rye, the protagonist Holden Caulfield at one point finds himself heading towards the museum, reflecting on past visits and remarking that what he likes is the permanence of the exhibits there. On early seasons of Friends, Ross Geller worked at the museum. The museum in the film Night at the Museum is based on the AMNH. The interior scenes were shot at a sound stage in Vancouver, Canada, but exterior shots of the museum's façade were done at the actual AMNH. AMNH officials have credited the movie with increasing the number of visitors during the holiday season in 2006 by almost 20 percent. According to a museum official, there were 50,000 more visits during the period December 22, 2006 to January 2, 2007 over the previous year. Several scenes in the 2004 movie, The Day After Tomorrow, were set in the museum's halls. The title of Noah Baumbach's 2005 film, The Squid and the Whale, refers to a diorama in the Milstein Hall of Ocean Life. The diorama is shown at the end of the film. 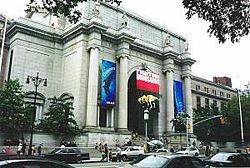 Other novels in which the AMNH is featured include Murder at the Museum of Natural History by Michael Jahn (1994), Funny Bananas: The Mystery in the Museum by Georgess McHargue (1975), The Bone Vault by Linda Fairstein and a brief scene in Motherless Brooklyn by Jonathan Lethem (1999). Portions of the PlayStation game Parasite Eve take place within the AMNH. A scene from Malcolm X is filmed in the hall with prehistoric elephants. 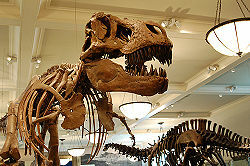 ↑ Amnh.org, American Museum of Natural History - Overview and Programs. Retrieved July 20, 2008. ↑ Amnh.org, Spitzer Hall of Human Origins. Retrieved July 20, 2008. ↑ New York Post, Ancient "Snail" is a real gem. Retrieved July 20, 2008. ↑ Amnh.org, Science at the Museum: Exploration and Discovery. Retrieved July 20, 2008. ↑ Rgweb.registerguard.com, Movie linked to surge in museum attendance. Retrieved July 23, 2008. Quinn, Stephen C. 2006. Windows on Nature: The Great Habitat Dioramas of the American Museum of Natural History. New York: Harry N. Abrams. ISBN 0810959402. Rexer, Lyle, and Rachel Klein. 1995. American Museum of Natural History: 125 Years of Expedition and Discovery. New York: H.N. Abrams in association with the American Museum of Natural History. ISBN 0810919656. Wallace, Joseph E. 2000. A Gathering of Wonders: Behind the Scenes at the American Museum of Natural History. New York: St. Martin's Press in conjunction with the American Museum of Natural History. ISBN 0312252218. Wynne, Patricia J. 2004. Exploring The American Museum Of Natural History A Children's Guide With Pictures To Color. Dover Pubns. ISBN 9780486437149. American Museum of Natural History Amnh.org. Horsley, Carter B. The American Museum of Natural History Thecityreview.com. History of "American Museum of Natural History"
This page was last modified on 17 March 2019, at 16:16.